They dont include backlog, or areas where there is likely to be a shift in migration from job growth/decline in certain areas. those areas that are expected to grow most rapidly over the next 25 years are, on the whole, already performing least well against their household formation projections. 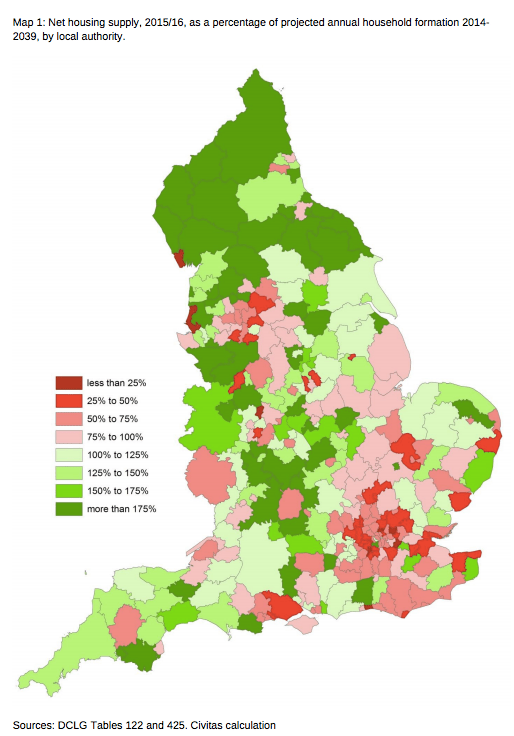 As can be seen at a glance from Map 1, housing supply is failing to keep up with household growth most in London and the South-East, where affordability pressures are already most acute. Measured in this way, there are also considerable supply issues in the North West and West Midlands, two areas that are the focus of concerted regional growth strategies for the years ahead…. The 30 fastest-growing non-London local authority areas in percentage terms are almost all in the South-East Of those, 21 were below the national average in terms of their housing supply measured against household growth, and only five supplied enough homes to keep up with long-term need…. To some extent, under-supply in fast-growing areas is made up by ‘over-supply’ in neighbouring or nearby ones; this is a key element in the ‘duty to cooperate’ in the National Planning Policy Framework, that asks local authorities to work together to manage housing supply across boundaries. Oxford, for example, met only 66 per cent of its household growth in 2015/16, but output in the surrounding districts compensates for this so that, for Oxfordshire as a whole, housing supply was 159 per cent of long-term household growth. Brighton and Hove supplied enough homes to meet only 56 per cent of its long-term growth, while West Sussex partly made up for this by supplying 113 per cent of its growth…. This report is essential – if the figures were recast to include backlog and a nationally balanced addition to reflect job based migration (Natantial Licthfield im looking at you) then we essentially have a mapped definition of where the regional planning problem is. Correlate the problem with Green Belt and the availability of browlfield supply from NLUD and you have a map of shortfalls the Housing White Paper will need to make up.